It is called English Lavender, however it is from the Mediterranean, and is commonly grown in France. The botanical name is Lavandula angustifolia and it is one of the hardiest of all. 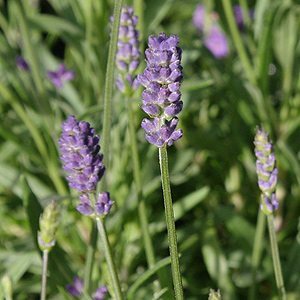 English Lavender is a narrow leafed type that comes in a number of forms, so when you go to buy it, know which variety you are after. The two main varieties offered for sale are ‘Hidecote ‘and ‘Munstead’, however even these come in different colours and with different growth habits. The most widely grown of all lavenders is probably Lavandula angustifolia (syn L. officianalis) also known as English lavender or one of the many cultivars found for sale. This is a tall growing species that when in flower (see picture at right) and can reach 2m (6ft) with the long flower spikes rising well above the foliage on nice clean stems. Lavandula angustifolia ‘Alba’ is the white flowering form, low growing and with pretty white fragrant flowers sometime called ‘white english lavender’. Widely grown a low hedge, in the cottage garden and of course for the production of flowers and oil. Munstead has been made famous through its use by the garden designer Gertrude Jekyll. Its tall growing and is the most heat and drought tolerant of the English types. Although other types are better in really dry climates. A dwarf variety named ‘Munstead Chase’ that will reach around 60 cm is also available. You will also find Hidicote in different colours, Pink and Deep Purple as well as the Violet Purple. Vera – Not widely grown, and requires a cool climate. Although it is revered for its oil. How tall will English Lavender grow? The answer is that height will depend on the variety. The ‘normal’ varieties will reach from .7m to 1m in height. This depends on the soil and climate. A few will reach 1.2m in height and the dwarf varieties are generally at around .3m. How far apart do you plant English Lavender? Again the answer depends on a few factors. If you are planting as a dense hedge, then try at around .3m (1ft) apart. If you want the plants to be individual features, then plant at around 1m (3ft) apart. Dwarf cultivars can be planted closer, the very tall varieties a little further apart. Two sub species L. angustifolia ssp. angustifolia and L. angustifolia ssp. pyrenaica, but many cultivars, including a few of the best known of all lavenders the ‘Hidecotes’ and ‘Munstead’. Many of the cultivars are not only improved flowering forms, with a range of flower colours, but also lower growing than the species itself such as Munstead Dwarf.